The Welsh 3000's, an amazing weekend of highs and... more highs! 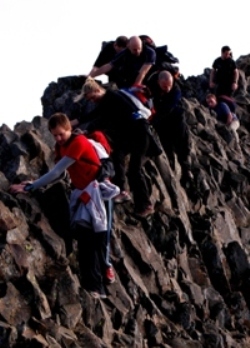 This challenge trek will see you crossing the breadth of rugged and exciting Snowdonia and summiting the 15 highest peaks in Wales. Each one of them over 3000ft, and grouped into three distinct ranges of hills; the Snowdon Massif, the Glyders, and The Carneddau. We begin day one on the Snowdon Massif starting with the mighty Crib Goch before going on to Crib y Ddysgl and of course Wales highest peak Yr Wyddfa - not a bad start to any mountain challenge. Then its down & across to the Glyderau range where we literally rise to the challenge of Elidir Fawr, Y Garn, Glyder Fawr & Castell y Gwynt before heading back to the accommodation for a hot meal and a good nights rest - you’re going to need it! Day 2 begins with a short drive transfer from our accommodation around to the third range of hills on our challenge - Carneddau. 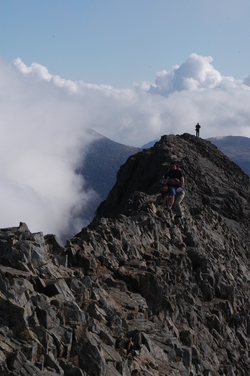 First though there’s the unfinished business of the Glyderau range. We begin with the ascent of Tryfan before tackling the Carneddau range proper. Our path now takes on Pen yr Ole Wen, Carnedd Dafydd, Carnedd Llewelyn, Yr Elen, Foel Grach, Garnedd Uchaf (yes, we do all 15 peaks over 3000ft) and finally Foel-fras - Congratulations, you’ve just completed one of the toughest and arguably the most spectacular hill walks in the United Kingdom. Now for a big feed and a stiff drink. Our walk is planned to take approx. 13 hours for the full day. And will be strenuous, so make sure you pack plenty of food! Finish walking by 18:00, return by minibus to bunkhouse. High Fives all round before heading home. Optional Extra Night Available - P.O.A. You will be staying in simple, clean bunkhouse accommodation. We shall be based in Llanberis. There are good hot showers. You will need to bring a towel (if you would like to wash!) and a warm sleeping bag. Your breakfasts are also provided. (Please advise if you are a vegetarian). In Llanberis you can get snacks, and good food in the evenings, your Leader will guide you to the best eateries available. Please bring lunches for two days - you may be able to find some food in Llanberis for each day’s lunch - but do not rely upon it! Evening meal will be available for around £10/head for a main course. Transfers (see special notes). Due to Snowdonia’s position on the Western Seaboard it bears the brunt of prevailing weather systems coming in moisture laden from the Atlantic. At this time of year the weather could go either way from warm temperatures to freezing cold – so be ready for anything – make sure you pack according to the list! Remember that layers are the key, allowing you to adjust your level of warmth more easily.We will almost certainly experience some rain during the weekend, so make sure you have suitable waterproof gear—both top and leggings.